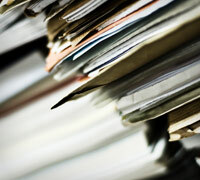 Next, file each category into a filing cabinet drawer or box. Clearly label what each file contains. Shred any papers that you don’t keep. It may take a little while to go through all your documents, but it’s worth it. Double your closet space instantly by using soda can tabs to hook hangers together.